"Performance-Based Parking Pricing" - Don't Yawn! It could be the next big thing. If the topic of parking pricing makes you yawn then think again! This is a hot topic in urban transport policy at the moment. They were actually working out for themselves (with a little guidance) the principles of 'performance-based parking pricing'. This innovation has been emerging recently at the urging of UCLA Professor, Donald Shoup. I am beginning to think that it has huge potential to improve busy city streets everywhere, including Asian cities. This last point is crucial. This objection appears EVERY TIME anyone proposes increasing the price of parking near businesses. It emerges too when performance-based parking is discussed. For example, New York's Columbus Avenue Business Improvement District is considering trying it out. and a Chamber of Commerce spokesperson has already raised fears that customers will go elsewhere. But that makes no sense. 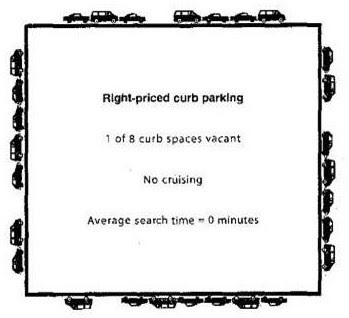 If the price is right, there will be high turnover of parked vehicles. No one can say people are no longer coming to the area. In fact, likely more can come because they can now find a space to park and the cycling, pedestrian and bus conditions will also improve by getting rid of all the cruising for parking. New York's StreetFilms has produced a great 5 minute on-line video to illustrate these ideas. So far, the best known (and very successful) implementation of this has been in the downtown of the City of Redwood, which is in the San Francisco Bay area. Now the City of San Francisco is planning the largest trial yet of performance-based parking pricing, under its SFPark pilot project. The program does nothing to expand the parking supply. San Francisco's long-entrenched policy calls for reducing reliance on the private automobile. People also would be able to check parking availability before arriving at their destination via the Internet, handheld devices such as BlackBerrys, or cell phone. Sensors would be embedded in the asphalt to keep track of when a parking spot is empty. The technology isn't new, but San Francisco would be the first American city to apply it on such a broad scale. That's one reason federal transportation authorities took an interest and decided to help pay for the experiment. These ideas seem to me to be highly relevant to parking-scarce Asian cities. The idea does not just have to apply to on-street parking. It could also be used for off-street parking that is owned by local governments. Does anyone know of any attempts to price parking in this way anywhere in the Asia Pacific region? HI -- I was directed to your blog by Dr. Shoup. Very timely for me. I would like to discuss some matters with you off line -- but can't find an email link. Please contact me at jvh@parkingtoday.com. You can view my blog at www.parkingtoday.com and click on blog.